Went on a trek to Bababudangiri with Aparajit. anitab and cyberscorpion last weekend. To get an early start we took an autorickshaw from the Chikmagalur bus-stand to the starting of Sarpadaari(Snake path). 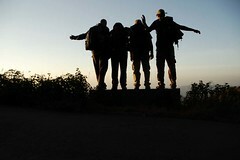 A beautiful sunrise and cool weather in the morning made the trek up Mullainagiri a pleasure. We took a long break here having our breakfast and taking in the views. Our destination for the day was GaaliKere(Lake of Winds) and the path intersects with the road at places. The path from Mullainagiri joins the road at a bus-stand with an abandoned water tank and a painting of Vivekananda and a few benches nearby; from here we had to walk on the road to Aththigundi where we had lunch. According to locals Bababudangiri was 7 kms by road and 2 kms by the walking path, which starts from behind a mosque there and climbs up gradually while the road zig-zags around and across mountains. Reaching Bababudangiri, we walked to Gaalikere again on the road with the sun ready to set behind the mountains; the sun was a large ball trying to hide behind the mountains at that time. While other groups who had come to the same place choose to camp next to the lake, we scouted around and found a flat area on a small hill next to the lake with a good view towards the east, for the next day's sunrise. Having our dinner under the clear star-lit sky, we were inside the tent trying to sleep at around 8:30pm. The twilight colors the next morning were beautiful, duller at the beginning and getting brighter and more vibrant before the sun rise. We lazed around after the sunrise, trying to get another round of sleep before heading back. Took the 3pm bus back to Chikmagalur, had dinner at Planter's court before taking the 11:15pm bus back to Bangalore. Did not take my camera along, cyberscorpion has posted here and here and anitab here. Wish you had taken your cam along - looks like a very beautiful place from cyberscorpion's images. I guess you would have made merry if you had your gear. we didn't trek at all this winter! Nands was off-shore, now I feel old ;) Have we left out anything on the western ghats ? Wanna do some basics now, how about Nandi Hills ? ps: I do recollect some memories but can't correlated to any specific trek. and you haven't been to bandaje while we have been there 4 times. All shots on target....Ahhhhh !!! One day I would like to go along with you...I have met only one of you, once, but I feel I would be very comfortable and the trip would be just fantastic. btw, when are you coming back? What a trek. That first ascent from Sarpadhari, when it was cold, chilly and dark, and then the sky changed colours and I could hardly walk because of gasping (and partly because I was out of breath!!) at the brilliant views all around.